Add / insert a multiple points and shapes (circles, borders) at once. This dialog box processes airspace areas, navaids and waypoints. Paste it into the left listbox of the block dialog box. Select the units of the input coordinates via the designated field. The units of the coordinates in the list at the right will be as selected in the Area dialog box. The name must precede the coordinates. For navaids, the name must be 2 or 3 characters long. If the name is 2 characters, AspEdit will automatically append an underscore character. For waypoints, the name must be 5 characters long. The format of the coordinates is permissive. Also the separators between the latitude and longitude and between the points are permissive. Use the copy / paste function: copy the coordinates from the aeronautical publication, and paste them in the left field. Always check the result in the field at the right. 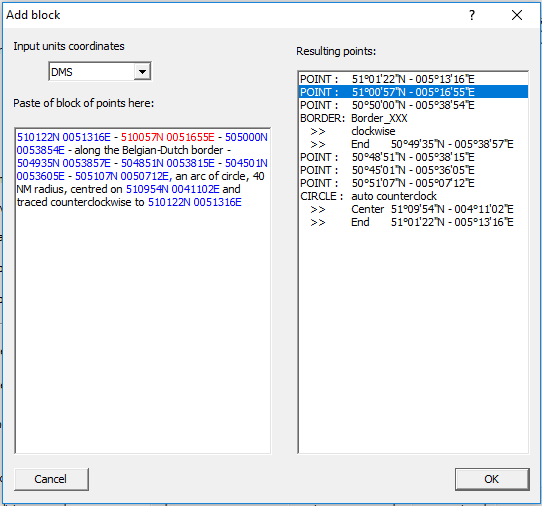 "Along border" segments will be recognised, but the border itself has to be selected manually from the Area dilaog box, after leaving the block dialog box. The coordinate selected in the right listbox will be highlighted in red in the right hand dailog box. If required you can apply manual corrections in the input field. Tip: if AspEdit can't handle separators or formatting, first paste the block into a text editor (eg Notepad ++), manually correct the issues, copy the edited points to the clipboard and paste them into the Poly-points dialog box.